Moved beyond words, there's no way to adequately express my visit to the 9/11 Museum and Memorial other than to say it is a beautiful and remarkable tribute to all 3,000 Americans who lost their lives that day. It might be off the beaten tourist path, but well worth the trip. I hadn't ever been. Ground Zero had become a term referring to a part of the city where I was raised - an area I knew so little of. Manhattan's southernmost point was, and is, a world all unto its own. I remember visiting the Twin Towers in my youth. I remember the massive scale that's simply indescribable unless you've been there yourself. Massive. Powerful and intimidating, even to someone whose home was in the concrete jungle. Like everyone I know, I remember where I was on September 11th. I was home with 2 babies and tuned into the Today Show as much of the country had. We saw footage of the first plane as it flew into the first tower. We watched as the 2nd flew into the North Tower. And just like that the world as we knew it changed. An hour outside the city, we lived in a commuter town. I knew local families would be impacted. I knew my own friends, who worked down there, would be impacted. I just didn't know the gravity at the time. Like the rest of the country, the rest of the world, I watched mesmerized, wanting to know how, why, this attack on my great country, on my great city. Nearly 15 hears have passed and the area is still under construction. The new transportation center, another architectural masterpiece, was recently opened to the public, and of course there is the Memorial and the Museum. It was time I paid tribute and I did, along with my children who are 17, 15 and 10, each of whom were incredibly moved. The waterfalls and reflecting pools, each about an acre in size, are set within the original footprints of the towers. They're massive and there's no way to appreciate their size unless you see them in person. The sound is loud, powerful and soothing. The Memorial plaza is one of the most eco-friendly plazas ever constructed. More than 400 trees surround the reflecting pools. Designed to convey a spirit of hope and renewal, it creates a contemplative space separate from the usual sights and sounds a busy city. The museum itself lies directly in between the two fountains, where the large globe-like Sphere was located. Damaged in the collapse, the Sphere is now displayed in nearby Battery Park City. The museum was built as a tribute to the original towers. Designed to look like the image of a partially collapsed tower, the structure very much resembles large shards of glass. The building, a mixture of metal and glass, reflects the natural outdoor lighting. Inside the tone changes almost instantly. The Museum respectfully pays a wonderful tribute not only to the victims in New York City, but to those in Washington, DC as well as those on board the plane that crashed in Shanksville, PA and those who lost their lives in the 1993 World Trade Center Bombing. The collection is both haunting and mesmerizing - it will move you to the core. The architecture mindfully takes us from exhibit to exhibit, paving the way from large structural items from the towers, to hollowed out fire trucks, to smaller tokens found in the aftermath. There's hours of original footage, photography and documentation. Voice recordings from the passengers of the doomed flights are as chilling today as they were fifteen years ago. The images of the victims are as haunting today as they were fifteen years ago. A special room was created as a tribute to them all. The youngest of the victims was a mere toddler. Immortalized, 3000 who perished remain imbedded in our memories, frozen in time, ageless. We weaved in and out of exhibitions, the vast majority is contained in a gallery where no cameras were permitted. Boxes of tissues are strategically placed throughout the museum. Visitors enter through a steel and glass pavilion that include two of the Twin Towers' massive steel tridents. Their presence, imposing, cannot go unnoticed. This is a museum that is serious, somber, reflective. There's nothing remotely cheerful or lighthearted about the space or the 23,000 images, 10,300 artifacts, 500 hours of moving images and 1,970 oral histories. It is in every sense of the word a living museum, a three dimensional history book. The building cost $700 million to build which was made possible through both public and private contributions, and will need $60 million per year to run. Security alone will cost an estimated $10 million a year. Above, the Trident columns are symbols and reminders of the past as they command your attention against a backdrop that represents the present and the future. One descends an incredibly steep stair case to get to the main exhibition space, to bedrock alongside the Vesey Street Stair remnant known as the "Survivors’ Stairs." This is where hundreds managed to escape their death on 9/11. The staircase is moving, powerful. Nothing in this space goes unnoticed, unappreciated. Original beams from the towers are positioned and displayed throughout. Once strong enough to hold up two of the world's most important structures, now resemble pliable metal sculptures. But these aren't sculptures. This is no art. As one looks closely at all the mangled beams strategically placed throughout, it still seems incomprehensible as to how they became so deformed. These buildings after all were built to withstand everything, including the possibility of a plane crashing into their walls. The brutally splayed and mangled columns were at the direct point of impact. In the days after the terror attacks on Sept. 11, 2001, an American flag appeared on the side of a construction site overlooking Ground Zero in downtown Manhattan. A construction crew hung the 30-foot flag on 90 West Street as a symbol of hope for volunteers searching for survivors in the wreckage of the World Trade Center. The flag, terribly tattered and torn was placed in a bag and was to be honorably retired. Years later it was removed from the bag, smelling of smoke, covered in ash and torn into 13 pieces. It then traveled throughout all 50 States where it was repaired and finally returned home. To read more about the story of the flag and its repairs read here. 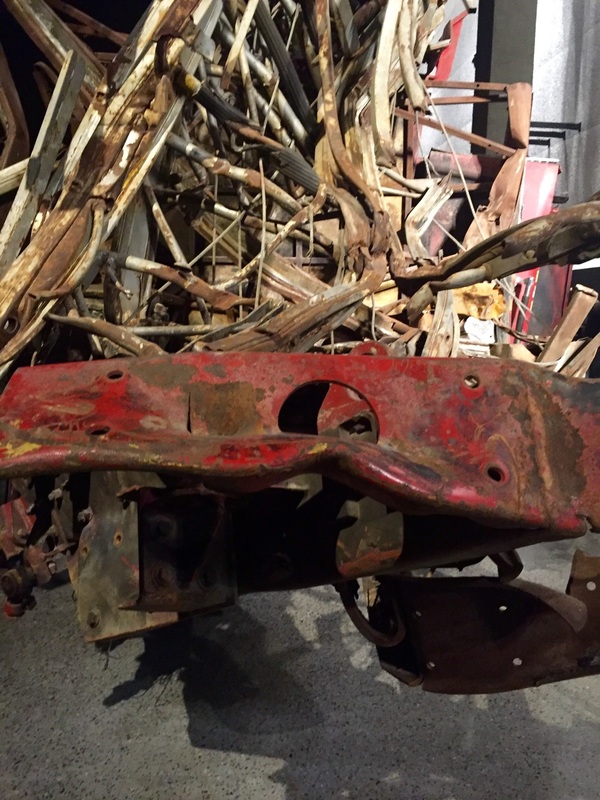 Many original beams and structural components of the original towers are on display, linking one exhibit to another. A detail of the memorial urn where names of each of the 2,977 victims is fitted into a unique space on one of the urn's 12 sides. The remains of the 360 foot spire that was atop The North Tower are pictured above and below. The 110th floor housed radio and television transmission equipment. The roof of the North Tower contained a vast array of transmission antennas. The large center mast contained the television signals for almost all NYC television broadcasters. After the September 11 attacks of 2001, the broadcasting equipment for the radio and television stations was moved to the Empire State Building. By the displayed remnants of Engine 3 streams footage of the truck and the first responders at the scene. Any other place this might seem like art, or a sculptural looking piece but this isn't either. It's one of the beams from the where Flight 175 made impact, damaging the building's infrastructure. One of the beams located between the 93 and 97 floors, at the point of impact. This was the last column to be removed during the demolition. Pause. Stop. Look. Reflect. No one is immune to the overwhelming magnitude of the artifacts. Each and every piece, no matter how large or small tells a powerful story. Airplane seat belts and windows, women's shoes, children's clothing, wallets, personal notes, video montages, photographs, voice recordings all humanize an important moment in history that won't and should never be forgotten. In the above image (to the right) and below are pieces of the slurry wall. 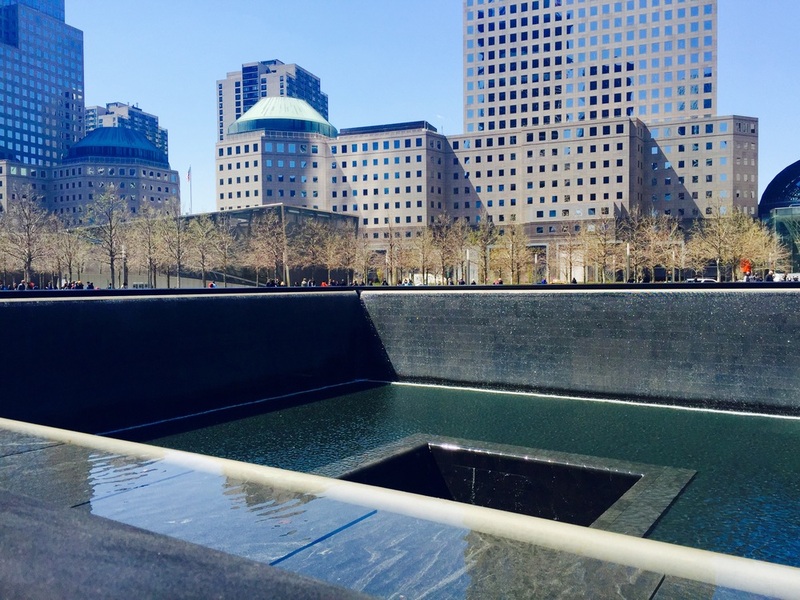 The following is an excerpt from Rizzoli's the stories they tell, artifacts from the national september 11 memorial museum as an explanation of the Slurry Wall and its importance to the building of the original Twin Towers. The world Trade Center was to be built at the western edge of lower Manhattan, alongside the Hudson River. The challenge of bracing the enormous weight of the planned towers was compounded by all that water which had to be kept from seeping into the building’s foundations. Aware that a new method for constructing underground walls in ‘difficult soil conditions’ such as the proximity to the water, had been developed in Italy in the late 1940s, leadership at the Port Authority of New York and New Jersey sent a young engineer named George J. Tamaro there in 1964 to learn him it was done. Three years later Tamaro would oversee the slurry wall construction that made erecting the World Trade Center possible. There were serious cracks in the Slurry Wall after the attacks and the wall would need to be reinforced. When the site was cleared the wall had been stabilized with the addition of nearly 1000 new anchors. Had the wall suffered serious cracks or collapsed the subways would have flooded and quite possibly all of lower Manhattan could have become submerged. In the museum we see the exposed back of the original Slurry Walls. The box columns were designated as historic assets and were preserved as such. Inside the museum, located seven feet below ground the visible tops of the cutoff box column outline the footprints that now houses the exhibits. Elements of the original Twin Towers, the box columns as well as the slurry wall has become a foundation for the future and a powerful link to the past. Above is a River Water Line Valve that was in the slurry wall. It carried water from the Hudson River to an underground refrigeration unit for the towers. It's about 6 feet tall. Above the two trident shaped columns soar into the air from the museum's lower level to the upper level where visitors begin their journey. They mark both the beginning and the ending of the museum visit. If you're in Manhattan, live near the city or are planning a trip there soon, a trip downtown will surely be worth your while. While slightly off the beaten visitor path, this is one worth venturing down. A month or so again I had the wonderful opportunity to visit the newly opened Saltaire Oyster Bar and Fish House in Port Chester, New York, just over the Greenwich border. Located in the beautifully restored Willet House Building which has been redesigned and transformed into a bright contemporary restaurant, filled with nautical memorabilia. To the right of the entrance you'll find the bar area, vibrant, energetic and spacious has a modern yet traditional feel. An impressive raw bar sits at the center, welcoming patrons as they settle in ready to place their drink orders, complete with televisions for the sports enthusiast wishing to cheer on his favorite team. The dining room, within the warm brick, though commanding is warm and welcoming. The antique hay lifts and wood beams retain the space’s history. Handsome black and white photographs of fishermen at sea capture authentic coastal life. The elegant yet rustic lighting casts a warm glow off the brick. The restaurant isn’t quiet; a lively energy permeates the air. 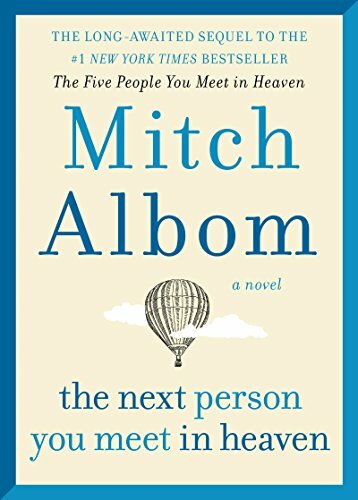 For the full review read here. I will tell you as much as this - their clam chowder may be the best I've had in a non-New England state. Milk based (as opposed to cream-based or thickened with flour) this one, perfectly seasoned with a perfect balance of clams and potatoes, will be the perfect antidote to the dipping temperatures. Saltaire Oyster Bar and Fish House :: Seared Sea Scallops in a Beurre Blanc with the Native Corn Celery Root Succotash and the Charred Cauliflower. 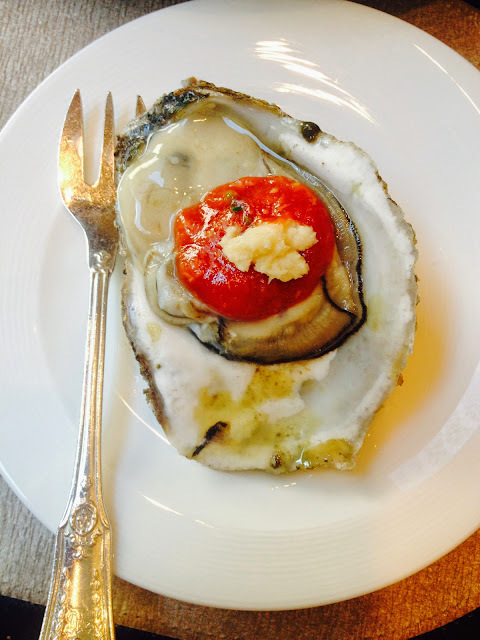 In just a few weeks Saltaire Oyster Bar and Fish House will open its doors in Port Chester, NY, just over the Connecticut border. From the docks to the table diners will enjoy the freshest of seafood, plus the camaraderie and charm of a local fishing village. Owner Leslie “Les” Barnes is a second generation seafood buyer and aquaculture buff who has, over the years, developed deep-rooted relationships with the best fishermen from Rhode Island to the Jersey Shore. Printed daily, the menu will feature the “top of the catch” from the morning's run to the the Fulton Fish Market. Set in the Willet House Building, a century-old structure nestled on the banks of the Byram River, Saltaire offers a casually elegant design with a touch of nostalgic nautical style and contemporary comforts. Saltaire, for those of you - like myself - who do not know, is a type of oyster, though no longer available in these parts. Saltaire Oyster Bar and Fish House. Owner Leslie "Les" Barnes and his father. “I speak the language of salty fishmongers and oystermen,” says Barnes, who fondly remembers early morning buying trips to the original Fulton Fish Market where he sourced seafood for the family restaurant, London Lennie’s, in Queens, NY. 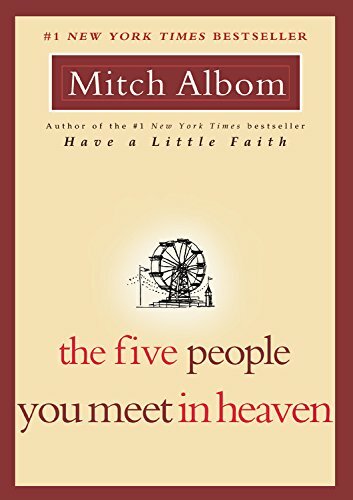 “My father would wake me up at 3:00am and we’d go off to the fish market for glistening, standout whole fish. The kind that jump out and say ‘Buy me.’” Barnes went on to master every station at London Lennie’s, taking over the business at just 22. After decades of running the restaurant and raising a family of his own with four daughters, he found a beautiful historic grain warehouse with 30 foot ceilings and original exposed brick just miles away from his home. “A building like this is a rare find. The timing was right to open Saltaire,” says Barnes. Serving as a visual and conceptual focal point of the space, an impressive marble raw bar manned by expert shuckers stands in the center of the barroom. The spread features a rotating lineup of ten to twelve of Barnes’ favorite in-season oysters, as well as seafood towers that range in size from “Hook” to “Line” to “Sinker,” with a generous selection of ultra-fresh lobster, shrimp, clams, oysters, mussels, and crab claws. Saltaire is housed in the Willet House Building, which was built by the Westchester Grain Company in 1903 when the Village of Port Chester was a thriving port. With the help of Interior Designer Kim Nathanson of Niemitz Design Group, the space was transformed into a bright, contemporary restaurant with nostalgic nautical charm. The dining room retains touches of its past incarnation with antique hay lifts and wood beam ceilings, the walls are covered in original black and white photos of fishermen at sea, offering an authentic snapshot of coastal life. At the bar, guests can settle in and enjoy drinks and oysters, as well as watch rival sports teams play on TVs placed at opposite sides of the bar. Saltaire is located at 55 Abendroth Avenue in downtown Port Chester, NY and opens in late-August 2015. For more information or to make a reservation, call 914.939.2425 or visit www.saltaireoysterbar.com (reservations not required). Stay tuned for my review! 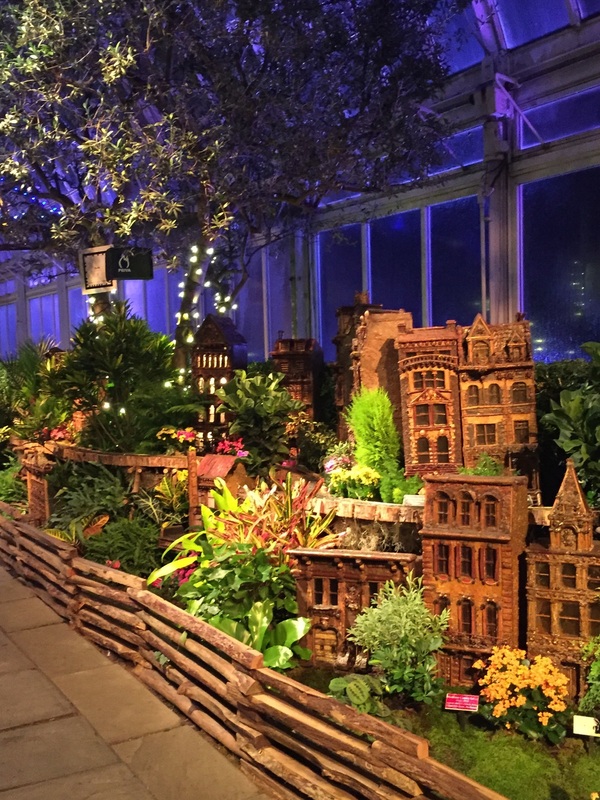 The other night my children and I headed to the New York Botanical Garden to see the Holiday Train Show. We had never been to the event at night. It was even more magical than during the daytime. The Holiday Train show is truly a wonderful event - especially for the younger set. But it's so much more than a train show as it offers something for everyone. 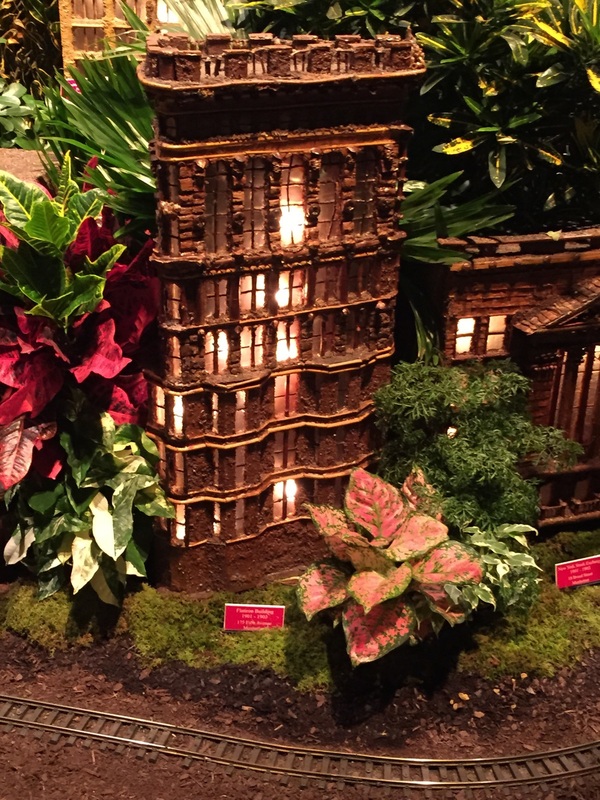 It's a must-see New York tradition where you'll find more than 150 favorite New York area landmarks recreated in botanical materials in the under the twinkling glow of the magical Haupt Conservatory! 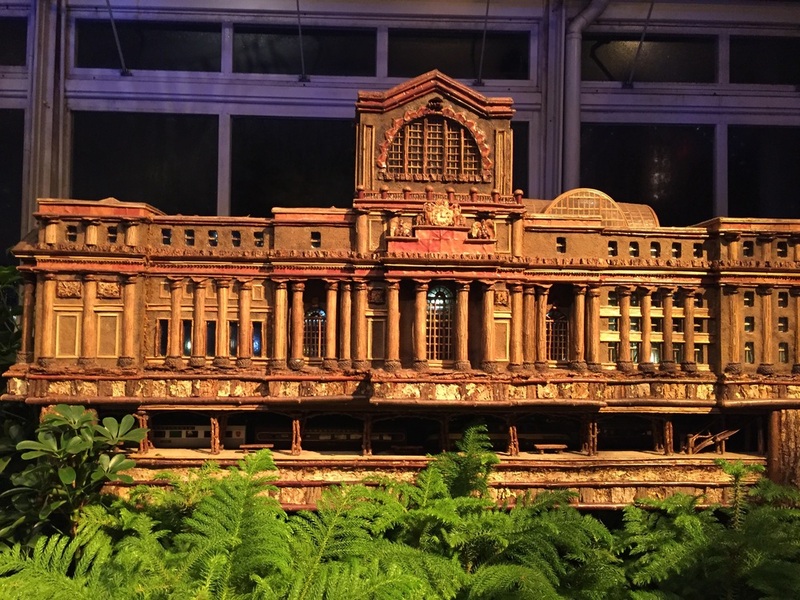 Step into a city in miniature featuring more than 150 iconic buildings, all re-created with bark, leaves, and other natural materials. What I love most about this wonderful show is that every year is just a little bit different - so you're truly seeing something new every time you go. When you go be sure to check out The Artist's Studio which showcases visionary artist Paul Busse and his team and shows how these these amazing small wonders are created. The show runs through January 19th and if you live in or are traveling to the New York Area this must be on your list of things to do! We've been members for a few years now. I grew up in Manhattan and have lived in and around the New York City area all of my life. It was not until recently that I took my first trip with my children, hand in hand. We love it there. And while some children, boys especially, may balk at the mere mention of the word "flower" (thank goodness mine do not) there's so much more to the gardens. I give my children cameras to bring with them. They can use their own iPhones/iPods, a small point and shoot or a DSLR. With thanks to social media, children love photography. My youngest, 9 took spectacular pictures with his iPod and posted them on Instagram. Photography is a perfect art medium for children - it helps them (adults as well) to see things in a different light and to slow down. More often than not, they're quite pleased with their pictures, whereas with paper and pen, or brush and pen, children are often frustrated with their efforts and their results. Ordinarily children rush through things - exhibits, gardens, and the like; this is quite common. Yesterday, armed with their photo-taking devices, the children each took their time to slowly wander, to appreciate, to soak in each detail, the colors, and the sheer beauty of it all. My 9 year old captured this image with my Canon DSLR fitted with a 75-300 zoom. As we made our way back to our car we ran into this little guy who was completely unimpressed with our cameras practically poking him in the face! He was happy as can be munching away at our feet! Before we left we made a quick stop at the Haunted Pumpkin Garden. These two characters greeted us as we entered. Don't they remind you a little of Bert and Ernie?! The property of the New York Botanical Gardens is enormous. We walked for hours and hours yesterday, seeing parts we'd never seen before, including the spectacular Peggy Rockefeller Rose Garden. What a treat... what a find! So if you're looking for something to do today, and you're in the NY area and you're looking for something to do other than apple and pumpkin picking, this should be at the top of your list! Right in the heart of midtown, surrounded by the some of the world's greatest museums, shopping and restaurants - and just a quick walk to Central Park - sits the St. Regis, rich in history and steeped in tradition. In 1903, as they had many other summers, the Astor family took an annual vacation to the family home in the Adirondack Mountains in upstate New York. That summer the grand and opulent hotel was in the midst of construction and did not yet have a name so John Jacob Astor enlisted the help of his family to help. His niece suggested St. Regis, the beautiful lake by the home which was named after Francois Regis, a seventeenth century monk who was known for his hospitality to travelers. Today, over a century later, the moniker remains a most fitting one. St. Regis Hotel in New York City is luxury defined and sets the bar incredibly, almost impossibly high. Here the glamour and charm of yesterday coexists beautifully today's modern lifestyle. While the hotel, lobby - currently under renovation - and restaurant exude the hotel's incredibly rich history, the rooms are historic only in their architecture - with high, austere ceilings, oversized windows, and exquisite crown molding - the decor is both elegant and luxurious by today's standards. 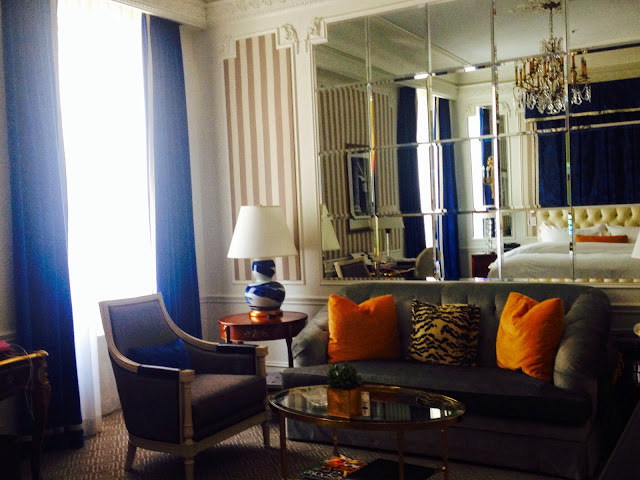 Luxurious colors, textures and style make the rooms at the St. Regis feel more like a private residence than a hotel. Our room - A simple but elegant King sized bed is set against a canopy, rich and deep in color and texture, flanked by two bedside tables set against a mirror-inlayed wall that reflects the light of the mirror on the opposing wall. Elegant white and gray shadow stripes gives the room a feel that is both masculine and feminine, modern yet traditional. The sitting area, featuring a small sofa, a chair and a coffee table are dressed in rich velvet of bright mustard, charcoal grey and deep ocean blue. Nothing about the room screamed out "hotel," not even the calling card from our personal butler - Yes, that's right, each visiting guest or family is assigned a personal butler. Your butler is on call and on hand for whatever you may need. Cookies? Milk? Champagne? Just call your butler! Let's talk about the staff at the St. Regis. The staff at the St. Regis brings customer service to an entirely new level - attentive, helpful, courteous. Other luxury and 5 Star hotels should take note. And then there's the personal butler. I mentioned that, right? Who doesn't want a personal butler? 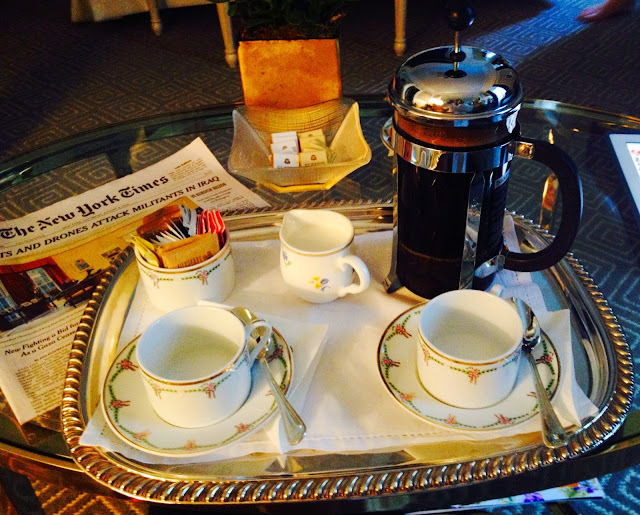 Complimentary coffee, made in a French Press, along with delicate china cups and morning paper are delivered up daily so you can ease into your day gently, and relax in the comfort of your own room. Our room was high up on the 15th floor and we were graced by the plentiful natural light that warmed the room. If you do not wish to dine in your room, make your way down to the historic King Cole Bar and Salon which is open for breakfast at 7:00 am and serves a full dinner until 11:00 pm. Of course you can stop in for their famous "Red Snapper." Stylish, sophisticated and glamorous, the King Cole Bar's history is worth sharing. 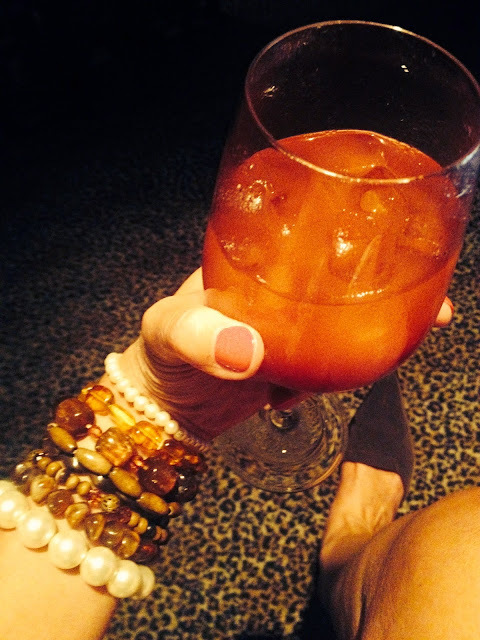 A lunch of oysters, their own chopped salad and a Bloody Mary perfectly hit the spot! 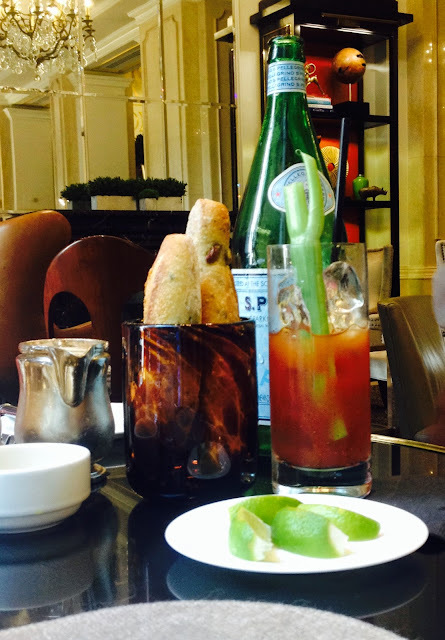 In fact, we thought the Bloody Mary to be so perfect, we went back later on for another! I fell in love with the charming, warm and animated Old King Kole bar - perhaps for the spectacular original mural by artist and illustrator Maxfield Parrish. In fact there are several Parrish pieces in the hotel lobby. Combine the art and architecture with the overall splendor of the building and one may indeed wonder whether they've stepped inside a museum. For nearly a century the genial king has greeted guests of the King Cole Bar including such famous hotel guests as Ernest Hemingway, Marilyn Monroe, Salvador Dali and John Lennon. To truly appreciate the significance of this mural one needs to learn the about history behind the iconic mural. 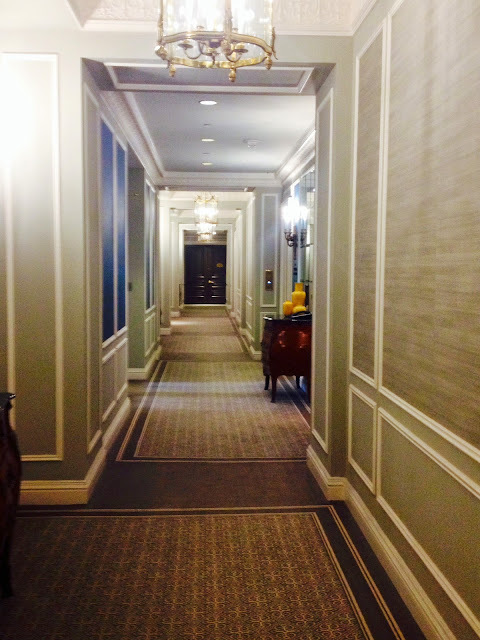 “Old King Cole” began its New York reign in 1905, when it was commissioned for St. Regis founder John Jacob Astor IV. The massive 8-by-30-foot painting was to find a home at Astor’s 42nd Street hotel, the Knickerbocker, but that bar fell victim to Prohibition in 1920 and was then converted into an office building. At that point the mural went into storage and moved to several locations. Finally it arrived at the The St. Regis New York and has called it home ever since. The interesting thing is that Parish was a devout Quaker. He was initially reluctant to paint anything for a bar, but was convinced to put his beliefs aside. Perhaps the greatest influence was that Astor was willing to pay $5,000 for the piece, an incredible amount of money at the time. Astor passed away in April 1912 when the Titanic sank. Gertrude Vanderbuilt Whitney, a close friend to Astor, asked Parrish to create a painting to be sold to raise funds for the Titanic staff who perished on the ship. Parrish, because of his close association with Astor, was more than happy to comply. 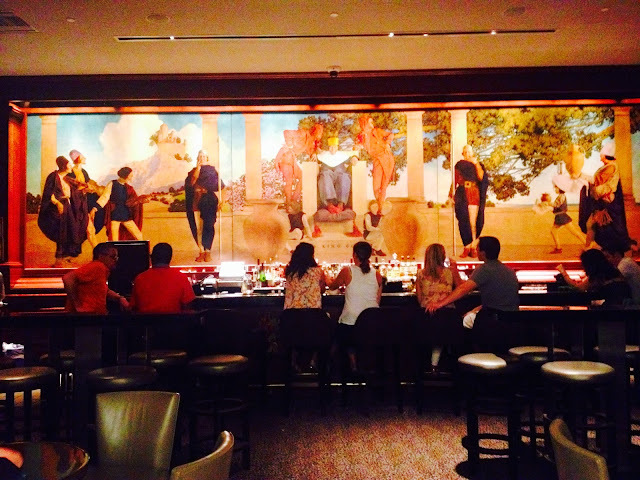 Parrish's mural essentially launched his career and Parrish would go on to create several other famous masterpieces, including “Daybreak” and “Garden of Allah,” a reproduction of which stands behind the bar at The St. Regis Monarch Beach. During the 1920s it was purported that 1 out of every 5 American homes had a print of either ‘Daybreak’ or ‘Garden of Allah’ hanging on their walls. The hotel also offers a gym and full service spa. ( I didn't use the gym - it is fairly small - but with Central Park just a few blocks away why would anyone want to run inside on a treadmill?) For a truly spectacular and pampering stay I strongly suggest a customized massage. Upon arrival I was whisked down for what possibly might have been the best massage I have ever had. I thank Galina for restoring a level of calm I've not experienced for years. After the massage, you may relax some more with your choice of champagne, tea or water. I opted for the tea (shocking, I know!) which was a good thing as a split of pink champagne, along with some strawberries and fresh whipped cream, was in my room awaiting my arrival. When I mentioned to a dear friend that I would be spending the weekend at the St. Regis, she told me that when she was a child her grandmother stayed there often - that it was a very old world hotel. She was surprised I wasn't staying someplace a bit more modern, but then declared me to be old school as well. After I gave her my full report, upon return, I'm quite sure she will visit the St. Regis as well. In fact, the only thing old school about the hotel, other than the architecture and decor, is the impeccable customer service. 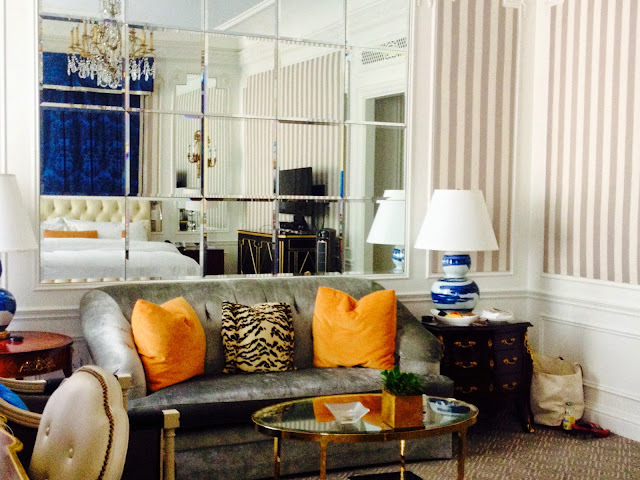 The St. Regis recently underwent a multi-million dollar renovation. The hotel offers all the modern amenities businessmen and families alike would ever need. Have I mentioned how incredibly family friendly the St. Regis is? Upon arrival the children are greeted with a coloring book and a teddy bear. Their stay is peppered with child-friendly meals, pint-sized bathrobes and in-room step-stools. Family-friendly excursions created now will lead to a life-time of lasting memories. The new Family Traditions program caters to travelers of all ages at one of the city's best addresses. 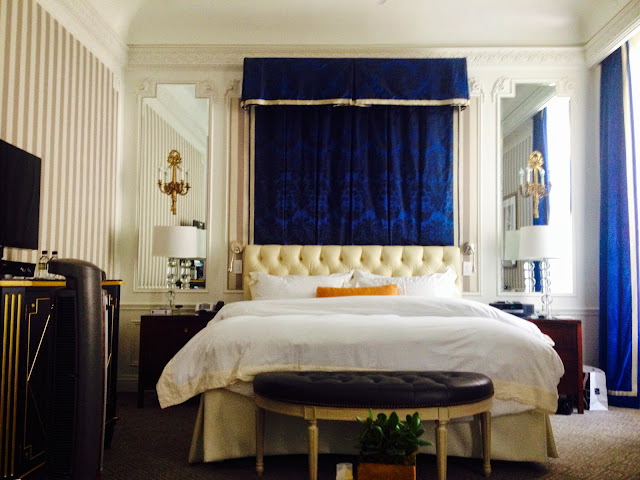 Traveling within 10 minutes from the St. Regis? Do be sure to ask about the hotel's Bentley available to all guests - even those traveling without children! At the St. Regis, luxury knows no limit and no detail has been left unturned. 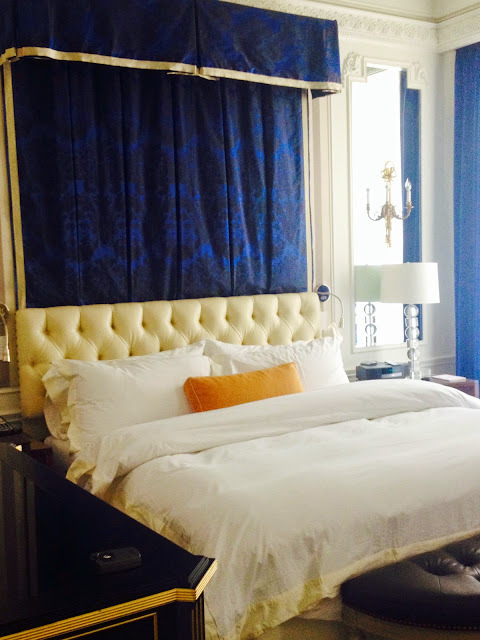 Modern, Del Posto and my behind the scenes tour of The Antiques Road Show! In "Maxfield Parrish", "New York City", "New York Luxury Hotels", "Old King Cole Bar", "St. Regis Hotel - NYC", "The Bloody Mary", "The Red Snapper", "hotels", "travel"